Sometimes when intentions are good and solutions for helping others and the world are the goals, creativity snowballs, breeding ideas that are truly innovative and unique. Chicago’s Logan Square neighborhood has a corner – literally – on this type of creativity. The Altgeld Sawyer Corner Farm at 3240 W. Altgeld St., started out as a community garden, but ideas about how to employ the Farm’s resources grew faster than the plants. Unlike many other community gardens, individuals growing produce at Altgeld Sawyer do not take their fresh vegetables home – they donate their output to the Christopher House located directly across the street. As a resource center for families at or below the poverty line, Christopher House runs educational programs, and provides a food pantry for these families, offering produce from Altgeld Sawyer. This Corner Farm also serves as an outdoor classroom for the students and teachers of Christopher House, enabling research projects and encouraging families to tend and water the garden. But its mission doesn’t stop there. What makes this community garden especially unique is its artistic emphasis, serving as a habitat for plants like milkweed, marigolds, and lilies that artists use for paper-making fibers and dyes. And it often serves as an outdoor artist’s gallery, featuring artists from the Chicago area. 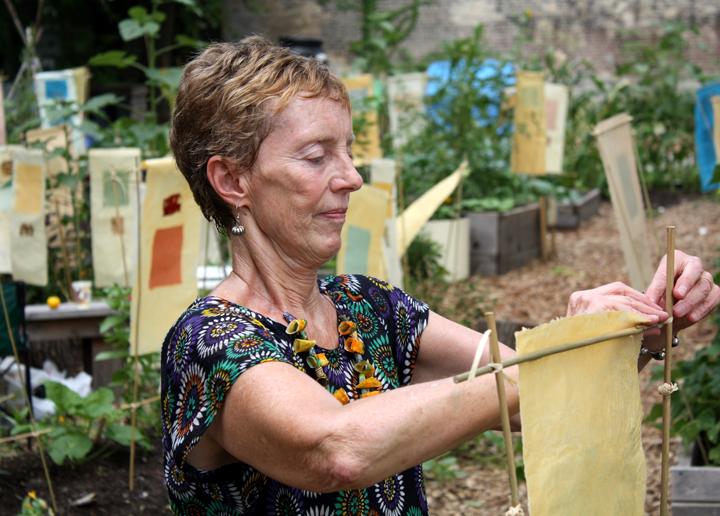 Chicago artist Laurie Wessman LeBreton recently displayed her installation “A Color Can Be A Prayer” in the garden. She started early in the morning, hanging about 120 of her colorful handmade flags made of abaca paper – made from a type of banana plant. Abstract spiritual symbols made of foil were centered on the flags. Artist Laurie Wessman LeBreton hangs her installation of handmade flags on Saturday in July. The flags are reminiscent of Buddhist prayer flags, Wessman LeBreton told me standing amidst her art which flapped in the Chicago wind, as if on cue, against the bamboo poles they were mounted on. They were spread across the raised beds and berms, competing at times with the yellow of towering sunflowers. Wessman LeBreton’s flags hung only for about 9 hours in the garden on a Saturday in July. They will be included in her art show in October at the University of Massachusetts at Amherst. This artist’s interest in papermaking happens to fit in with the Corner Garden’s history – and the founders’ goals. The idea for the project started with Logan Square residents Margaret Hartmann and Noah Swinney Stein wanting to start a community garden on a vacant lot at the intersection of West Altgeld and North Sawyer. The lot’s owner, Al Jakich, let them start planting in the Spring of 2009 on his land that had sat empty for 30 years. Brie Callahan, the communications lead for Altgeld Sawyer, said that vacant lots attract crime. The founders knew that filling the space would make the neighborhood safer because people would be in the garden working, meeting, and learning. 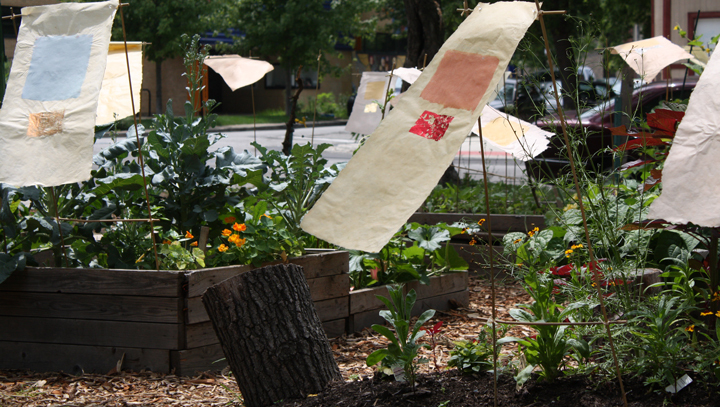 Serendipitously, Logan Square resident Shayna Cohen (now Shayna Norwood), a papermaker, printmaker, and fine artist, wanted to develop a community garden where fibers for the papermaking process would be grown alongside vegetables for the community. She had been awarded a $5,000 Aiko Fellowship in May 2009 from the Columbia College Book and Paper Department to begin developing such a project. After meeting Noah and Margaret, the Altgeld Sawyer Corner Farm began its unique existence. Not only was this a community garden that would supply the neighborhood’s food pantry, it would help combat crime, and become a haven for Chicago artists. Callahan, also a garden volunteer and neighborhood resident, stressed that the community garden is run entirely by volunteers with full-time jobs who donate their time. She pointed to tomato plants that she started from seeds she saved from last year’s garden. Planting from seeds, of course, saves Altgeld Sawyer a lot of money. The organization only runs about two small fundraising events each year, each generating about $500. Callahan also pointed out the 4 compost bins set in back of the garden. Residents from the neighborhood can bring any organic produce they would normally throw away to the bins, and it all goes back into the garden. And she pointed out the 4 community herb beds. Anyone from Logan Square, whether a Corner Farm member or volunteer, or merely a resident, can take herbs from the Farm. 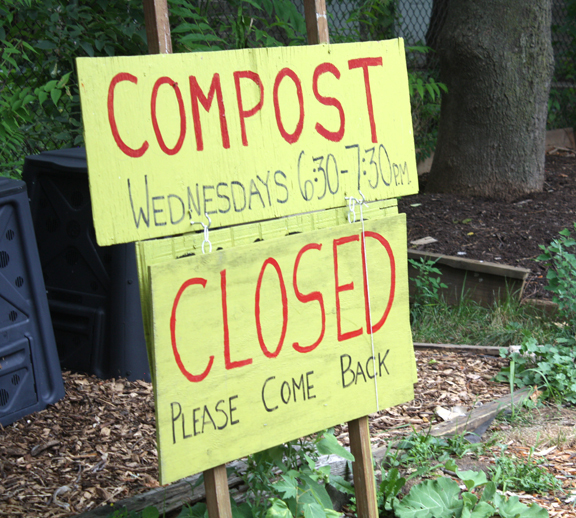 Composting bins for the neighborhood are available at the Corner Farm. Those who grow plants in the garden bring their interests to the soil. Some are into wildflowers, others into the plants that produce dyes, still others like Callahan, love kale and tomatoes. 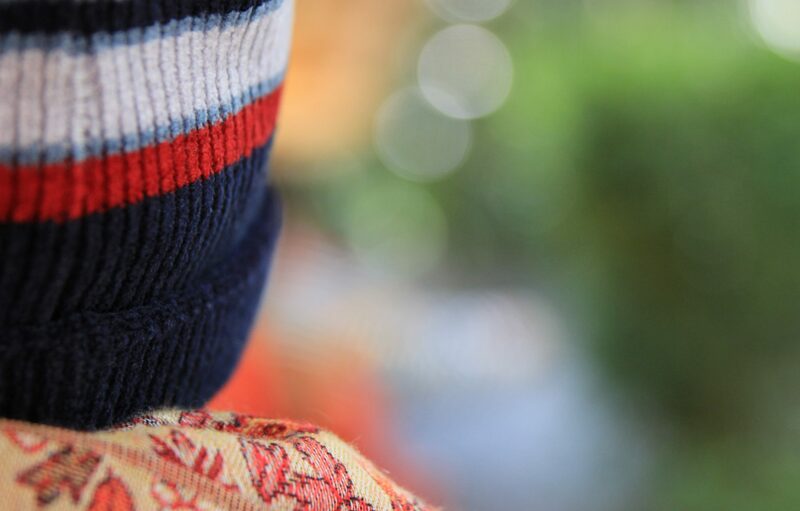 One person happens to know a lot about harmful insects and plant diseases. “Basically, if you have an idea, you can try it,” Callahan said. She pointed to a raised bed where someone was experimenting with the “three sisters” of corn, beans, and squash. Each year the volunteers learn more, and the garden gets better, she added. They have learned how to rotate crops, for example, and to keep harvesting and planting to keep production high. However, their main goal remains to stock the food pantry, which serves a large number of Hispanic families. With that in mind, the Farm grows hot peppers, basil, and chili peppers – all main ingredients for Hispanic tastes and foods. This ambitious group of volunteers wants to keep helping food pantries beyond Christopher House, so they are currently developing another community garden only a few blocks from Altgeld Sawyer, at the intersection of Kimball and Medill Streets. For creative ideas on community volunteering and sustainable gardening, it will be worth watching how this new garden comes to life. Visit the Altgeld Sawyer Corner Farm for more information.